I was wondering if i should scan my preface and introduction to volume one of Barefoot and Pregnant? They first appeared in 1991, and again in 1999. The publisher’s interest was to keep costs down. Understandably, that is one reason there are no footnotes. I know I could, or should have provided references at the time. Whether I can do so now is another matter. But if anyone wants a particular reference, I promise to have a go at providing it. Likewise, I wonder if nowadays I would still hold all the views i gave voice to then. It’s a moot point. Anyway here’s the preface. Let me know if you think i should scan the intro too. Just click on the image to make it larger. I thought I’d have a quick look to see if i can find a reference or two which might be considered as endnotes. On page one, the orphans to South Australia are called ‘filthy and indelicate’. See British Parliamentary Papers Irish Universities 1000 volume edition, Colonies Australia, volume 13, Sessions 1851-52, Despatch from Governor Young to Earl Grey 8 March 1850, Enclosure 1 in Number 10 from M. Moorhouse at the Children’s Apprenticeship Board, p.255. On the second page, George Hall was questioned at the South Australian parliamentary enquiry into excessive female immigration, 11 February 1856. Report of the Select Committee of the Legislative Council of South Australia into Excessive Female immigration Minutes of Evidence, Adelaide, 1856, p.17, q.267. He was an opponent of the orphan scheme, having made known his views to Stephen Walcott, Colonial Land and Emigration Commissioner, in April 1854, when he visited England. I’ll see if i can put together some other ‘endnotes’. Susan Stewart per Pemberton is in PROV (Public Record Office of Victoria) VPRS 521 vol.1, 1853-57, Female Prisoners’ Personal Description Registers. Susan appears, for example, 13 November 1855 at entry number 1043 and in early 1856 at number 133. Some of this material may be searched online, I understand. VPRS 516 is the Central Register of Female Prisoners in Melbourne gaol. Despite what i say in the paragraph above, it would be good to know how many of the orphans made court appearances, and for what reasons. Elsewhere in my blog I’ve mentioned some of the problems associated with this. Here are a few names extracted from PROV VPRS 521; entry 129, October 1854, Amelia Nott who claimed to have arrived by the New Liverpool in 1849; entry 833, Mary Ann Tyrell per Roman Emperor, 1848; Mary Ann Seville (?) per Eliza Caroline, 1850, 1856, entry number 30. A number of entries in the Register name the ships that carried orphans but not always providing the correct date of arrival. One would have to check the other dates when those ships arrived in Port Phillip. And in Melbourne gaol records, PROV VPRS 516, we find Jane McGuire per Diadem, Catherine Ellis per Lady Kennaway, Mary McGill per Derwent, Ellen Brennan (Ellen Stewart) per Diadem, Margaret Baker per Eliza Caroline, Elizabeth Dunn per Lady Kennaway. Were these really Earl Grey orphans? What of those who assumed an alias or had taken their husband’s name? It’s not a research subject for the faint-hearted. But what an interesting comparison might be made of orphans in Melbourne gaol and those Julie Poulter has studied in Darlinghurst gaol in Sydney. It would be interesting to extend this project to include Earl Grey orphans who died in Asylums or other institutions. Here are a few examples; Mary Kelly per Maria who died in Newington Asylum in 1904; Mary A. Weatherall per Lady Peel buried at Dunwich 1914; Margaret Geraghty per Panama died Rockhampton of chronic alcoholism and neglect, 1891; Emma Kelly per Earl Grey died Woogaroo, 1879; Ellen Brodie per Pemberton died Ararat 1883; Eliza Martin per Roman Emperor died Adelaide Destitute Asylum, 1905; Ellen Fitzgerald from Skibbereen per Eliza Caroline died of malnutrition in Waterloo 1881. I know of others but it is sometimes difficult to confirm an inmate’s orphan status in these institutions. Not that this changes anything I’ve said in my preface. This entry was tagged Barefoot & Pregnant? 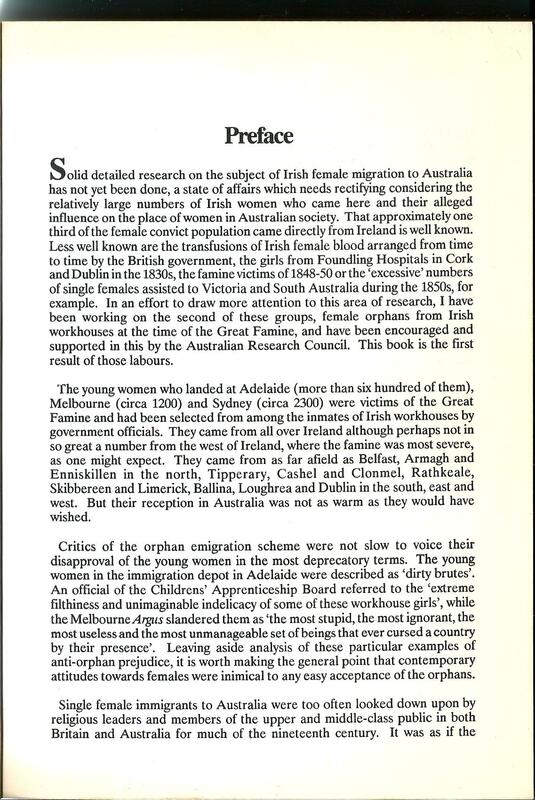 preface, Catherine Duffy per Roman Emperor, Earl Grey orphans, Irish Famine orphans, Irish Famine orphans to Australia, Irish female emigration, PROV VPRS 521, SRSA GRG65/1, Susan Stewart per Pemberton. Bookmark the permalink. I could not print the new preface. My “orphan” came to Adelaide in 1849 Margaret Hill. She was 6 years in Adelaide then went by coastal steamer to Melbourne where she married Patrick McGrath my great Grandfather. If you are using a PC you can right click what you have selected and paste it to another place where you can print it. I think. Surely it’s time for a reprint, Trevor? Possibly with a new chapter at the end? And / or an e-book publication? Please, Trev. Thanks migseder. Hope some photos turn up. I’ve offered to do something with Perry and Richard (and Cheryl?). But they’re busy just now with other things. And yours truly is having trouble with his peepers. We’ll see what happens. love the hair. I love the Keats quote. 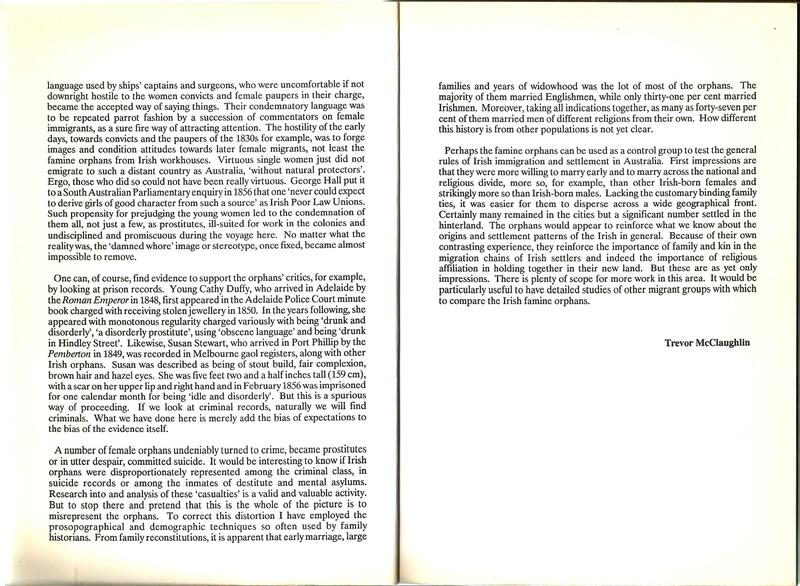 I did find the scan of the preface informative and I imagine the intro would be as well, if that is any help in your decision. I did of course mean Yeats. Do you know where I can get a copy of your book? I’m from Jane Hutchinson who married Thomas Buckler. I’m pretty sure there’s a couple of lines about her in your book. I have a couple of photos of Jane in her old age and from all accounts, her and Thomas were very happy. Keryn, I’m pretty sure your library would have it, or could interloan it for a small sum. Here in NZ, the Auckland library has it, although I’m astounded to find that Christchurch, Dunedin, and Wellington don’t. It has been so well-read it’s been thrown out? It’s been stolen? They all had it from new. Please our Trev, find a twelve-year-old to put it on the Internet, at least. I did spend ages putting orphan stuff on the initial http://www.irishfaminememorial.org website. Others have added to it and kept it up-to-date since. It’s a beaut database and research tool, and they are always eager to hear from you.